Air barrier assemblies are divided into building assemblies for walls, roofs and foundations. These broad heading, in some cases, are then sub-divided into specific types of walls, roofs and foundations. Air barrier assemblies are made up of air barrier materials and connected with air barrier accessories. ABAA has set a maximum air leakage rate for wall air barrier assemblies as being 0.04 CFM/ft2 at a pressure difference of 1.57 lb./ft2 [0.20 L/(s·m2) at a pressure difference of 75 Pa] when tested in accordance with ASTM E 2357 Standard Test Method for Determining Air Leakage of Air Barrier Assemblies. 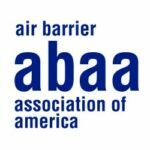 Get your air barrier material evaluated and listed with ABAA.